Phalanx continues to manage a successful line of Euro games and "geek" games, or even a combination of the two, like in the excellent "War of the Ring". 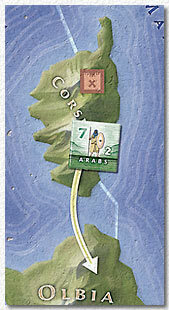 Since the time when Lew Pulsipher was inspired by the now forgotten hex and counter wargame "Ancient Conquest" to create a comparatively simple wargame that creates what he calls a "sweep of history" the mechanics of "Britannia" have been a fan favourite, and there are now many variants of the game that recreate other place's histories. For an excellent overview on Britannia-like games please visit the website of one of the world-wide leading "Britannia"-experts, Rick Heli. Andreas Steding, designer of Italia I and II, has already created one of the best known Britannia variants, the monster game "Hispania", which recreates the history of Iberia, today known as Spain. There are "Britannia" variants which simplify the basic system - "Hispania" and "Italia" certainly do not go this road but rather add chrome and special rules that give the players more choices but also more headaches. "Italia" is - no surprise here - a recreation of the history of Italy from ancient times. Unusual for a "Britannia" game it comes in two completely different versions that cover two different time periods. The first one - another first - is especially designed for THREE players, and once you consider the history depicted here it makes sense. In 10 rounds the players play the rise and fall of the Roman Empire, from the Götterdämmerung of the Greeks to the final days of the empire. One player will mainly be busy with the Romans, and his task is to hold and expand the Roman position and deal with pesky revolts and upstarts. The other two players play all the minor or big empires that constantly threatened Rome, most notably the Carthaginians with Hannibal, whose campaign is actually a major event in the game. The interesting thing is that the game system constantly forces the two non-Roman players to either gang up against Rome - which certainly has some power to defend itself - or to go for quick victory points against each other. 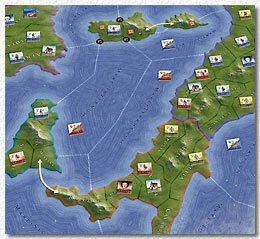 The second game, Italia II, recreates the history AFTER the fall of the Roman Empire, and is designed, like most Britannia games, for 4 players. I will not go too much into the rules here, but instead add a list of major differences between the "Italia" and the "Britannia" system (it's not a short list) below. A handy overview of when the units/nations of all players appear in which round - something that is usually found with any "Britannia"-style games. This info is only found on the nation cards themselves, which are covered with tiny print. A turn order list of nations on the gameboard itself. This is only found on a separate sheet that is used to look up many other things. Some nations easily amass more than 5 gold. There is a +5 counter for the money, but even with that only 10 gold can be recorded, large nations like Carthaginians and Romans easily exceed this limit. Any kind of historic reference (i.e. what time period a turn represents) - this is a glaring omission that is kind of surprising when one thinks about the detail and chrome that went into this game. Andreas Steding has added a lot of chrome to the "Britannia" game system here, avoiding some overly complicated mechanics that made "Hispania" very long to play. Still, this is "Britannia" on steroids - the decision making is much more difficult as there are lots of things large nations can do on each turn: raiding, naval moves, building cities, campaigning. The latter mechanic simulates the long campaigns of Hannibal and the like, something like a mini game in the game as other players can react to the ongoing campaign moves, also something that has not been seen yet in "Britannia". All this might be too much for some. 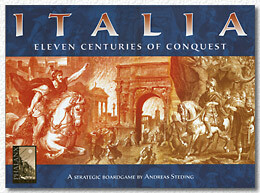 "Italia" certainly isn't a game that makes "Britannia" more accessible for the common market, rather the opposite. But there are many interesting ideas here - the campaign system for example. Where the game shines is in its 3-player scenario (or rather "game" - as the 3-player version is completely different from the 4-player version, there are different nations, even partly different rules). This is the first time it has been done right, with basically two sides representing the nations oppressed by the Romans that constantly struggle among themselves, and the third player representing mostly the Romans in their struggle to dominate the peninsula. Game material is top notch, as usual with the "Phalanx" line, which is always put together with great care and love, although there are some strange omissions (like a historical reference or an overview over when all nations/armies appear). The rules are not for the faint-of-the-heart - even Britannia veterans will have some new concepts to struggle with, although they will still feel at home. Recommended, but not for the casual gamer. You should have a day free for your first game, 8 hours recommended. MAIN DIFFERENCES BETWEEN "BRITANNIA" AS WE KNOW IT AND "ITALIA I/II"
Highland works similar to "mountains" in "Britannia"
Cities also produce one gold. Gold can be saved indefinitely. May appear in "massing areas" which have to be left, otherwise pretty similar (7.2). Capital declaration can be changed at any time, like in "Britannia"
Unlimited stacking with leader, or also for the other players during some "reaction moves". Stacking limits are pretty much always in effect, even in retreating. Straits stop movement like in "Britannia"
Units have different "to hit" numbers (printed on the counters), that have to be rolled on 10-sided dice, like in "Hispania". Elephants, Knights and Consular Legions have special abilities. Cities don't defend with dice, they just add defensive capabilities. If victorious, city can be "sacked" and is destroyed (flipped to "ruin" side). The pillager gets 4 gold. A city that is "sacked" can't be rebuilt in the same turn. Rebuilding: remove one unit (not leader) in the ruined space when it's your turn, city is rebuilt from ruins. Raid combat is a new concept and is directed at pillaging cities if at least one damage is created. Defending land units are NOT hurt. If city is pillaged, attacker receives 4 gold, and the city is "raided", which is different from "sacking" in that it can be rebuilt IMMEDIATELY out of turn sequence. Like in "Britannia", but Attacker can also retreat to OTHER spaces than the one he entered from, if they are either free or occupied by his own people. Nation victory points are much more complicated than in "Britannia" and often differentiate between "areas" and "cities" controlled. This is a new concept. At certain moments in history nations can start campaigns, basically a huge stack of units (no stacking limit) with leader that has to be paid 1 gold for each move. After each of these moves nations adjacent to the campaigning leader can, in turn order, do reaction moves. Move to Battle: move any number of units adjacent to the campaigner's space into battle, disregarding stacking limit. Move and See: Move one stack to one adjacent space ANYWHERE on the board, without initiating combat, or to join an already existing combat (either the space with the campaigning leader or an overrun space). ATTENTION: it seems stacking limit is in effect here! It is also possible to leave the space the campaigner has just entered, thereby giving ground (think of the real Romans reaction to Hannibal's campaign). Raiding in Overrunning spaces are possible, but only during a campaign (again think of Hannibal). "BLOCKING" is a new concept that benefits the campaigner: for 1 gold AND 1 unit sacrifice he can prevent movement in ONE adjacent space to the campaigning leader. In general different rules for each nation, like in "Britannia". Otherwise very similar. The subjugated nation's income is halved and rounded UP, the subjugating nation gets the rest. Areas controlled by the subjugated nation do NOT count as controlled, only in certain circumstances. Some nations get the possibility to REVOLT. They can be subjugated AGAIN after such a revolt. Sometimes submission is FORCED when falling below a certain threshold of units/areas. It is sufficient to simply move one unit into an area of a nation that has forced submission. No combat will take place and the nation immediately submits. Is a 3-player game and totally different from the 4-player game (ITALIA II). It has completely different nations and time periods, so one can say that Italia is 2 games in one, not one game with a 3-player variant. Some gamers actually prefer the 3-player game to the 4-player game. Rome can only be permanently occupied in Round 10, and is always automatically rebuilt. Major Battles: is a new concept that describes battles with 3 or more units ON EACH SIDE. Some nations get extra points for winning major battles. Patrimonium Conversion: Twice per game the Patrimonium player can convert any one unit of another adjacent nation.